iDailyDiary Free is a program tailored for taking daily notes, creating a journal, putting your thoughts into writing etc. The documents you create are encrypted and require a password to access. The built-in editor supports graphics, hypertext links and links to other diary pages. iDailyDiary is fully searchable so you can track down important dates and reminders. You can also export your diary to HTML web pages. A "pro" version is available with additional features including spell checker, thesaurus, topics (group related entries), themes support (50+ themes included), tables, etc. Writes settings to: Registry: Last window location and last opened diary. @Vavo: with the exception that the files reside encrypted on my HD at home and not unencrypted on an unknown and far away server which you have no control over. If you need a formless text editor with strong encryption, please try CryptoTE 0.5.390. I have version 3.41 and use it occationally. 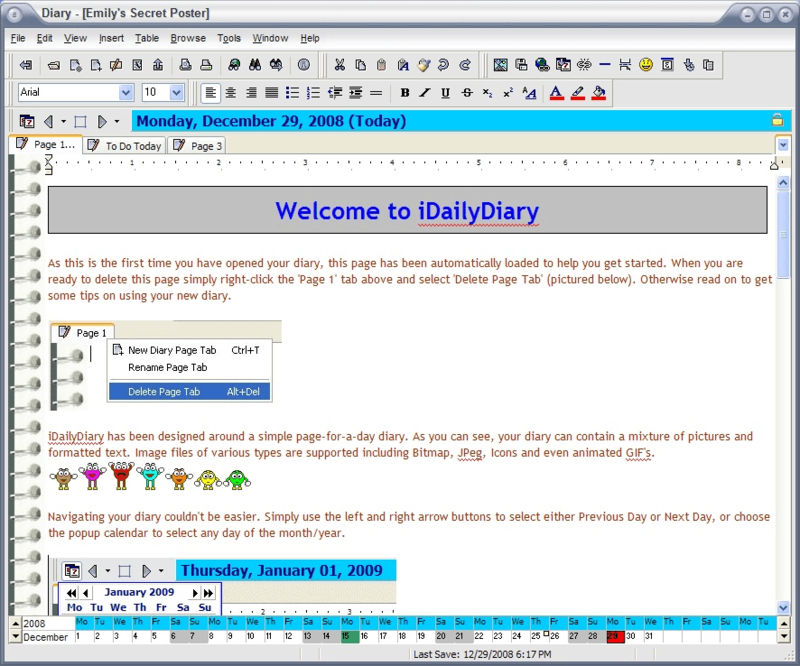 "All versions of iDailyDiary have always encrypted the diary data files, whether they are password protected or not. From version 3.00 the encryption has been improved to a 128bit Blowfish cipher." Have a look at Advanced Diary (the last freeware version was 1.3 - http://www.aplusfreeware.com/categories/LFWV/AdvancedDiary.html. This allows backup to Rich Text Format files, if you don't trust diary 'databases' this could be the option for you. Store the diary and files on a TrueCrypt volume for security (although the software does support password protection). Just use Evernote. There's a portable version for your USB drive plus it syncs automatically. is there another program like this that is portable? i'd rather have a diary than a blog! there needs to be another option for this kind of app. i think i might write a diary app in Java that uses the JSystemTray applet in JRE 1.6 and stores the data in flat xml. people who need it encrypted can use TrueCrypt to store the xml files. Yeah... I had it dump my diary once too. Not sure what the remedy for that is. I'm glad I hadn't had much in it. Caution is warranted. I used iDD until it lost my diary, twice, and the two backups I'd made failed. They were unable to solve my problem.